Uttarakhand Public Service Commission has given an advertisement of Interview Schedule for Uttarakhand Special Subordinate Education (Lecturer Grade) Service 2014 Exam. For this exam the Admit card was released on 21 March and Answer key was declared after the exam conducted on 05 April 2015 at different centers. The result was declared on 12 June 2015. 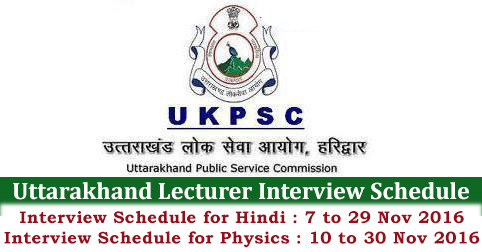 UKPSC has released notification of interview schedule for the post of Biology Lecturer (Women), Chemistry Lecturer (Women), Commerce Lecturer (General) and Economic Lecturer (Women). Candidate should bring fully filled application form (which can be download from the official website www.ukpsc.gov.in) along with Deshna Patrak, marksheet and all important cerificates and should be present at Gurukul Kangari, Haridwar on before 9.30 am. Help us to improve this article/job posting "Uttarakhand Lecturer Selection Interview Schedule". We would be glad if you can comment below and provide your valuable suggestions and feedback. If this page have any wrong information/list or out of context content, then you can report us as well. this recruitment is for which school? When will be the result of the interview of mathematics of uttrakhand announced. Hlo sir..chem interview result itni late kyu h.